I worked with UI designer Aaron Johnson at Ratio to produce a series of short clips that would be integrated into a Microsoft presentation at WPC 2013. 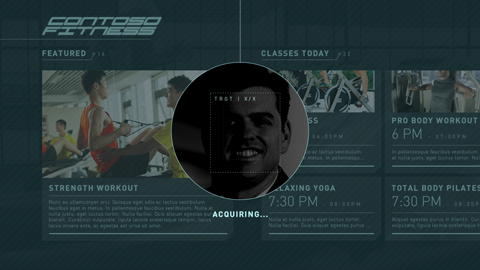 Aaron designed a Sports Gym app that would be implemented for the presentation by developers at Microsoft. A primary feature of the app is facial recognition via the camera of a Windows 8 device. 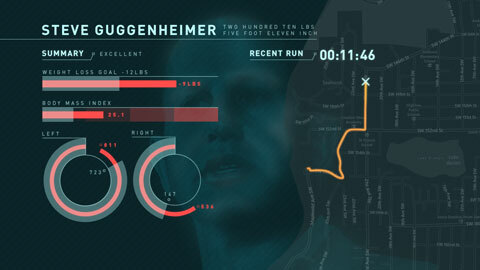 I worked with Aaron to provide animation guidance for the dev team on how the facial recognition could look onscreen. We cranked out several quick revs as the timeline was incredibly tight; a couple variations on the login are included in the video above. 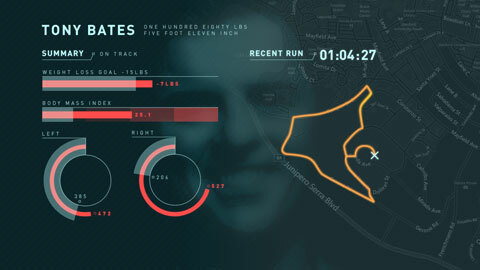 While the facial recognition elements were actually built, the presentation relied on video clips for the user profile screens. We also rev'd quickly on these, as content changed with additional users, etc. The presentation was well received and was shown several other times throughout the conference.